“All I really need to know, I learned in kindergarten” was just a cutesy saying for me until I actually spent a day with kindergarteners. Now I understand. The day’s activities began with Kid Writing, a time for students to draw pictures in their personal journals and practice writing about them. “Do you have a kid journal?” a boy named Max asked me. I told him that I didn’t. “I’ll make you one,” he said. He disappeared and then returned within a few minutes, presenting me with a paper booklet neatly stapled down the side. 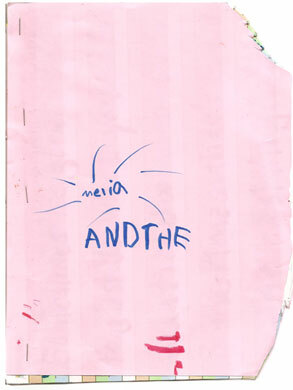 He had trimmed the side of the page “to make it look nice” and had printed the words, “Melia AND THE” on the fluorescent pink cover. “Melia and the what?” I asked him. I told Max that this was such great advice that I would write it down. I printed his words in oil pastel inside my new journal, on the paper with dotted lines for handwriting practice. When I showed him his own words on the page, he said, “This will be on the first page to remind you, for life.” This kid was a regular Yoda. I wished I could shrink him down to pocket-size and carry him around with me—my own insightful little Pez dispenser.